We now offer FREE taster sessions! Aimed at newcomers who are considering joining one of our orchestras. We will arrange for you to pop along to a rehearsal and experience all things NYO for an evening! 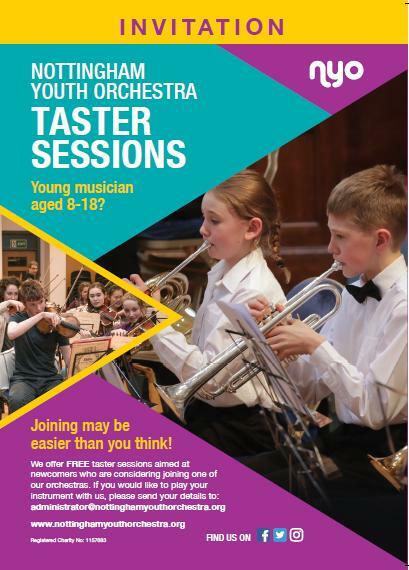 Please email: administrator@nottinghamyouthorchestra.org to register your interest. Once you have experienced a taster session you can apply to join us at any time of the year. First of all you need to fill in a registration form - email us and we will send you a form. WHICH ORCHESTRA SHOULD I APPLY TO JOIN? WHAT WILL I HAVE TO DO TO JOIN? Usually we will invite you along to join in with a rehearsal on a Thursday evening during term time to see how you get on. You may be asked to prepare a couple of pieces in advance and you could be given a short piece of sight-reading geared towards your ability level. Nothing to worry about! IF I AM UNSUCCESSFUL WHAT HAPPENS? If you are not quite ready to join the orchestra that you applied for you may be offered a place in the orchestra below or added to the waiting list. We will write to you to let you know how you got on and what to do next. HOW MANY GET IN EACH YEAR? It depends on places but at least 60. We will write to you once as soon as we can but please be patient during the summer period as we usually have a lot of applicants to deal with. I DIDN'T GET IN LAST YEAR ­ CAN I APPLY AGAIN? Yes as long as you are under 18 and are in full time education. IF I GET IN WHEN DO I COME? We will advise as to the best time for you to start. We will send you a welcome letter before you attend for the first time. NYTO 6:30pm-8:30pm, NYIO and NYO 6:30pm-9:00pm. We rehearse at the Becket School in West Bridgford NG2 7QY Thursday evenings during term time (Tuesdays for the Jazz Orchestra). WHAT DO YOU DO IN REHEARSALS? Each section of each of our three orchestras have their own dedicated tutor. Some weeks we have a full rehearsal and some weeks we split off into sectional rehearsals or a mixture of the two. We have a short break half way through each rehearsal so remember to bring a drink and a snack. You will also need to remember to bring a stand, your music and a floor protector where applicable. We prepare for a concert usually at the end of each term in venues such as the Albert Hall, St. Mary's Church and the Royal Concert Hall, Nottingham. Visit our concerts page for more information. We rehearse at the Becket School in West Bridgford NG2 7QY Thursday evenings during term time (Tuesdays for the Jazz Orchestra). We charge £355 a year for the Senior and Intermediate Orchestras and £290 for the Training Orchestra. It works out at around £4.50 an hour. We have a bursary scheme for families who genuinely cannot afford to pay. Please get in touch as soon as possible if you wish to apply for a bursary. We also run residentials, tours and workshops. Some of the workshops are free of charge. The cost of residentials can be between £118 - £130. 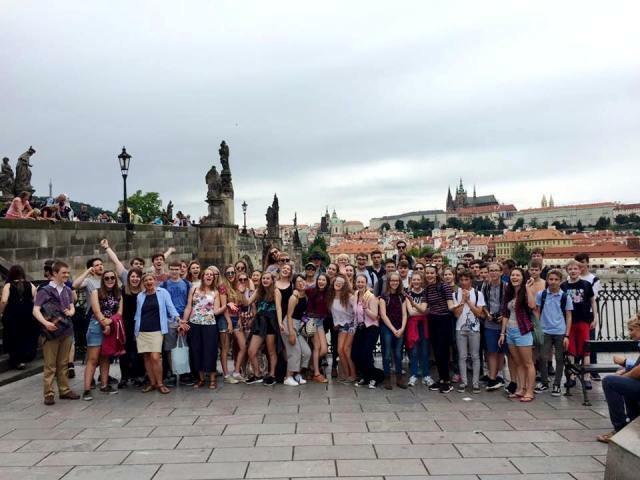 The cost of the senior orchestra tour is dependent on the destination and usually takes place during the first week of the summer holidays. ONCE I AM IN THE ORCHESTRA DO I HAVE TO AUDITION EACH YEAR? You usually do not have to audition to keep your place in your current orchestra. Only under exceptional circumstances (such as lack of practice) would we ask you to do this. However you will be informally assessed throughout the year to move up to the next orchestra. I DON'T LIVE IN NOTTINGHAM. CAN I STILL JOIN? Yes, as long as the journey isn't too much for you. IS IT OK FOR ME TO BELONG TO ANOTHER MUSIC GROUP? Yes, as long as you can manage the extra commitment. We have a policy that school music commitments must take priority over orchestra. HOW CAN MY PARENTS/CARERS GET INVOLVED? Nottingham Youth Orchestra owes its success over the last 30 years to collaboration between professional musicians, talented young people and a team of volunteers from a diverse range of backgrounds and with varying amounts of time to spare. A small voluntary committee is responsible for organising the orchestras and all the rehearsals, concerts and tours etc. It's a massive job and we depend on the support and help of parents to make everything run smoothly. If you think your parents/carers can spare some time to help then please get in touch. It is very rewarding and we would be very grateful! Please contact Paula Watt (01636 830930 or email). GREAT, I WOULD LIKE TO APPLY TO JOIN. WHERE CAN I GET A FORM?